Edmonton shredders STRIKER have won their third Edmonton Music Award for "Metal Recording of The Year" for their single "Phoenix Lights" off their 2016 album Stand In The Fire, a record packed with incredible riffs and colossal anthems, all laced together with epic harmonies. The album was both self-released via their indie label Record Breaking Records and self-recorded by the band (Dan Clearly (vocals), Tim Brown (lead/rhythm guitars), William Wallace (bass), Adam Brown (drums) plus help from Randy Black (PRIMAL FEAR, BIF NAKED, ANNIHILATOR) who filled in on drums while Adam was away during recording) along with mixing done by genius Frederik Nordstrom (BRING ME THE HORIZON, IN FLAMES, OPETH). 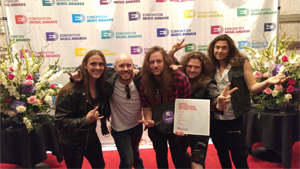 "Winning an Edmonton music award is the icing on the cake for an already great year for us. Stand In The Fire opened a lot of doors for us and we are proud to be recognized by our hometown 3 years in a row." All Else Fails - "The Forever Lie"
Black Friday - "Suffering In Stereo"
Juliet Ruin - "Rogue Down"
Silence The Machine - "Lost"
Watch the "Phoenix Lights" video on KNAC.COM HERE. In additional news, STRIKER have been also nominated for a 2017 Western Canadian Music Award for "Metal/Hard Rock Artist of Year". This year's WCMA will be held in Edmonton, AB on September 14th. STRIKER will be hitting the road in September and October for tour dates across North America with Swedish melodic death metal innovators DARK TRANQUILLITY along with American thrashers WARBRINGER. The tour is in support of STRIKER's latest self-titled album released on Feb 24, 2017 via their indie label Record Breaking Records. The album features 9 shredding tracks that are all killer and no filler to continue the band's classic mix of heavy metal.